I've been having a re-think about techniques for making art. I've always steered clear of tracing, the word 'CHEAT' rings too loudly in my ears. For me, it has connotations of other 'childish' activities such as dot-to-dot or colour-by-number. All bundled together, these seem condescending and simplistic when given as an activity to an older generation who have shaped and navigated a complex world. However, what we're trying to achieve with arthur+martha is to give confidence and a voice to people, many of whom haven't drawn for 50 or 60 years. We often work with people who have dementia, and may experience anomalies with sight, causing them to interpret the world around them in unusual ways. In fact, normal ageing can lead to visual difficulties including cataracts, glaucoma, muscular degeneration. Ah, getting older can be so much fun. So how to encourage confidence, without condescension? How to foster a sense of pride in people's achievements, although their skills have changed? 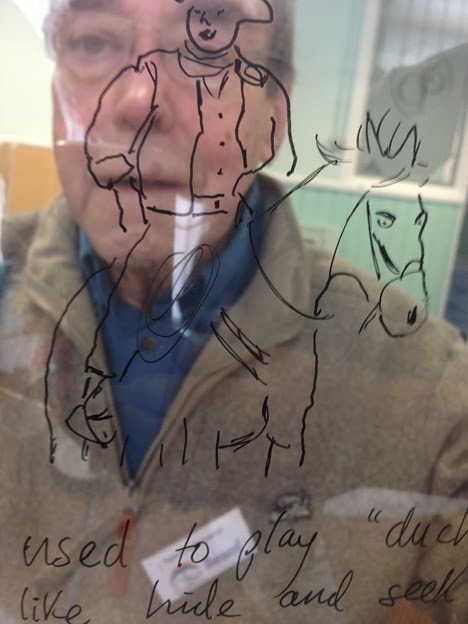 Yesterday we used tracing as part of a creative/reminiscence package, investigating how films and books created the background for play acting. Bernard (above) chose the photograph of John Wayne and carefully re-interpreted him in line on acetate. This isn't as simple as it sounds, the lines were drawn sensitively, each selected with care. 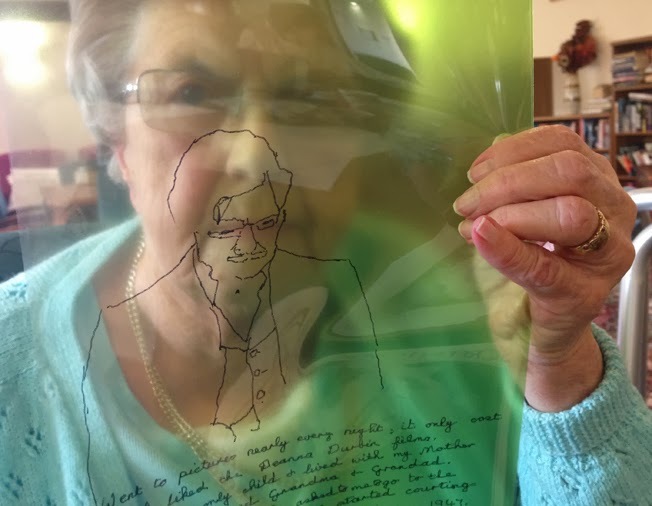 The physical act of drawing supports fine motor skills, creates an atmosphere of calm and deep concentration and can help stimulate further reminiscence and discussion. We are in fact keeping good company when it comes to using techniques such as tracing. It's thought that the artist Vermeer (and Old Masters generally) used optical aids such as the camera obscura to develop skill and technique. Cheating? Artistically, the pieces created yesterday felt very poignant. 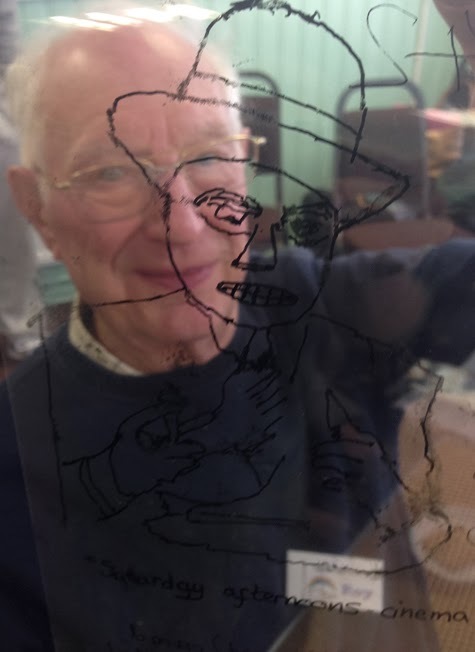 Bernard's drawing of a childhood hero, sits with his lines of reminiscence describing hide and seek in a bombed out Oldham. The photo above evokes the boy he was then, with the man he is now. The screen bravado of Wayne is layered with acceptance and real, lived experience. Vera carefully drew from a photo of Clarke Gable. Her writing on the layered acetate shares her joy of the cinema as a shy young women - and her late husband who confidently asked her on their first date to the flicks, several decades ago. Some of the group were very happy just drawing, with no need to trace. 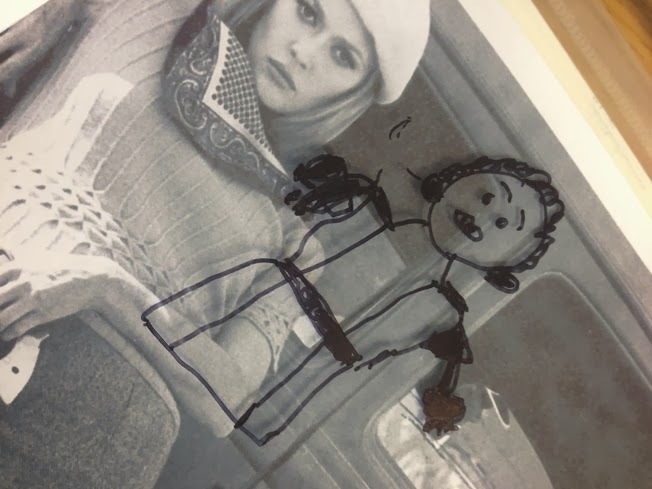 Molly's drawing (shown above) is of Shirley Temple. Molly described the cinema as escapism, leaving the films dancing and singing like her heroine, in contrast to the poverty she lived with. In the photo she has juxtaposed her Shirley with Faye Dunaway's glammed-up gangster-ette in Bonny and Clyde. Roy (below) shared with my dad a love of the gangster movies. His Edward G Robinson snarling in sharp focus, belies the gentle face behind. Roy's image was a diptych of two Edward Gs, one smiling the other a frown. Other firm favourites for films and play acting were cowboys and indians, the Lone Ranger, doctors and nurses. As a child, who would you have chosen to play? And is the trace of that role model still with you now?